Can you tell what a guitar power chord the D chord is? So far that's been at least four progressions that start off with a D chord. With the D-Bm-G-A progression, we have another switch-up of chords. 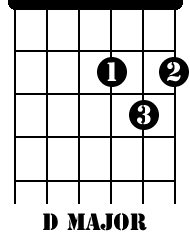 You're familiar with the Bm-G sticking together like in the first progression (D-A-Bm-G), but this time we're separating the D and A chords. Kinda like two kids in church… yea, like that. So we kick of the progression with D, and instead of a quick move to the A chord, we bounce up two frets to the seventh fret for a Bm chord. Don't worry, it's not that hard. Bm is just like Am, just two frets up the neck. You just have to move your A chord from the last progression we learned. We covered this before on the B chords page. 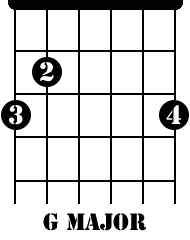 Now drop down to the G chord, and then hop back up two frets to the A. Here's a couple songs to practice for this set. It's cool how Simple Plan starts off with an acoustic sound in this song – kind of poppy and easy and then BAM! They crank up the distortion and slam the chorus through. They pretty much use the progression throughout the song. There is a slight twist when you play this song, though. You have to tune your strings down a half step to match Simple Plan's tuning on the recording. So now your strings are Eb (E flat), Ab (A flat), Db (D flat), Gb (G flat), Bb (B flat), eb (e flat). Tricky! Here's some tabs for "Welcome To My Life" by Simple Plan. OK, here's the switch-up of the chords to G-A-D-Bm. 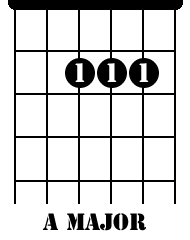 G major is another one of those guitar power chords. Just swap the two chord pairs from front to back. This set leaves you on a bit of a sadder tone, probably a good progression for a ballad of some sort. I'll come back with some examples soon. 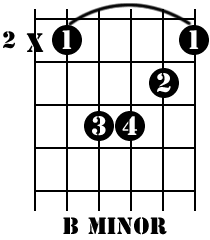 Moving on to the next progression with a great guitar power chord set – the G-D-C progression.